Today we're getting right back into it with the deep, rambly posts I've come to know and love so well. I'm hoping that I've structured this post semi-coherently, but when my brain gets going on a topic that it's passionate about I have a tendency to waffle so apologies for that! Recently I've been thinking a lot about happiness, and how much of it we get from other people. I wholeheartedly believe that one of the most important things in life are the people you have in it and your relationships with them. Our family and friends can have a huge impact on our happiness and it's expected that a lot of our happiness comes from the people we interact with on a daily basis. I think it becomes an issue however, when we begin to rely on those people for our happiness. I guess an example of this could be if someone does something nice for you and as a result it makes you happy, instead of that being an added bonus to your already content day it becomes something you rely on for the next day, resulting in a decrease in happiness if said person doesn't perform another nice act. I'm aware that may have made no sense at all, so I'll dive straight into my main points for this post! HAPPINESS IS SOMETHING EVERYONE SEARCHES FOR... It's highly common to hear the phrase 'I'll be happy if I had more money', or 'I'll be happy when I get a better job' uttered in our day to day lives. We're always planning goals, setting achievements or striving towards something we don't already have, and in a way this is a positive thing to do. It pushes us to pursue what we believe will make our lives better and if we focus on achieving goals that are important to us, it allows us to bring happiness into our lives that we have obtained ourselves. HAPPINESS CAN COME FROM ALL SORTS OF THINGS... On the flip side however, you don't have to pursue drastic changes to make yourself happy. I feel like achieving happiness is a very vague idea because happiness can come from a million different things that all differ from person to person. A kind of deep-rooted happiness, that probably feels more like contentment, can come from healthy relationships, job security, having a home, a fulfilling career etc. 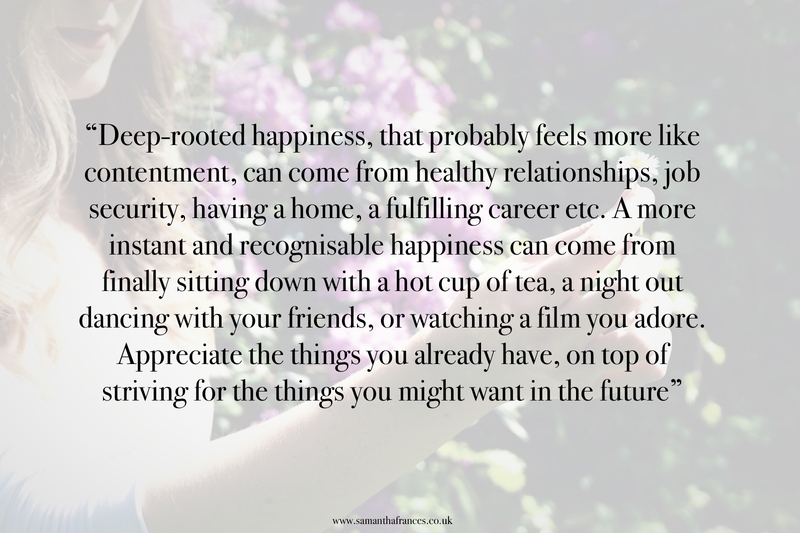 A more instant and recognisable happiness can come from finally sitting down with a hot cup of tea, a night out dancing with your friends, or watching a film you adore. Appreciate the things you already have, on top of striving for the things you might want in the future. MAKING ANOTHER PERSON RESPONSIBLE US UNFAIR TO BOTH OF YOU... It's incredibly easy to rely on someone else to make you happy. If someone does something to make us feel special, or someone prioritises spending time with us, we feel happy, and there's nothing wrong with that! It becomes unhealthy when we begin to expect those things, and if we don't get them our happiness levels decrease. Everyone has their own lives, and whilst our relationships bring us a great deal of happiness, relying on them for it will put unnecessary stress on both of you. IT'S YOUR LIFE... Following on from the point I just discussed, if certain people are who we rely on for happiness, what happens if one day our relationship ends, we drift away from our closest friend, or our family members meet someone new and move away? Life is always changing and people are always moving forward in their own lives. It's unfair to ourselves to limit our happiness to one specific person or point in our lives, and whilst it's always going to negatively affect us when these things change, we can soften the blow if we have other aspects in our life that bring us happiness. HAPPINESS FLUCTUATES... I think it's also important to note in a post like this that happiness isn't a constant thing. A person can live a 'perfect' life, find happiness from everything from our career and relationships to our hobbies and interests, and yet still have days where we feel horrible. Life isn't about being happy all of the time, and you should never expect yourself to be. I guess my meaning behind writing this post all stems down to one argument. Allow yourself to be surrounded by people who make you happy, as much and as little as you want, but similarly focus on finding your own happiness, and not rely on others to give it you. Fill your life with a variety of things that bring you happiness - whether that comes from your career, your family, your lifestyle, your hobbies, and all of the small things that are oh so important. Sometimes what I really want to read is a deep rambly post and this was just sheer perfection. 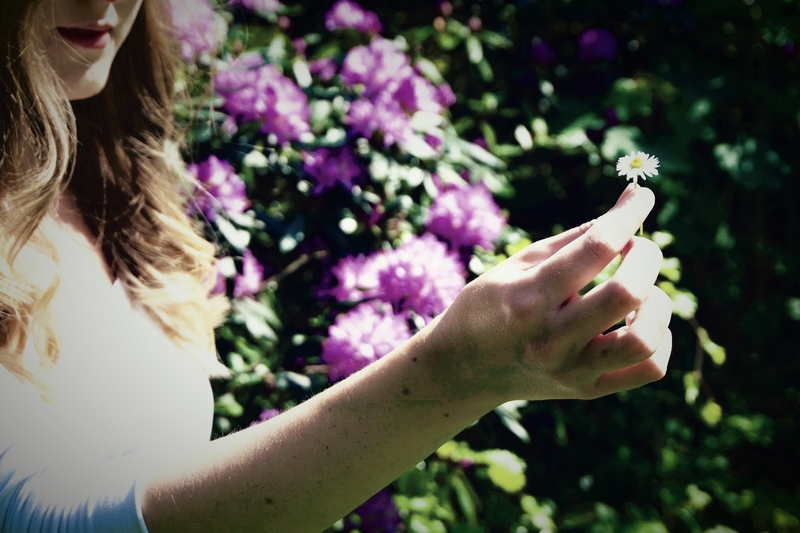 It was so nice to read this beautifully written blog post! honestly, this is very important but from time to time we tend to slip off and base our happiness on other things.